BitDefender Total Security 2010 is comprehensive security software for Windows operating system that provides proactive protection against viruses, spyware, hackers, spam, Internet security threats, firewall protection, and along with system maintenance and data backup. BitDefender Total Security comes with user-friendly interface which designed for expert or novices that adapts to the chosen profile and provide quick access to the main security functionality. BitDefender Total Security 2010 also features three dashboard views (Novice, Intermediate, and Expert) to better accommodate users with different levels of PC knowledge. In addition, BitDefender Total Security 2010 also comes with Active Virus Control features, which constantly monitors all of the processes on the PC and blocking any malicious behavior before it can cause any damage. Furthermore, BitDefender Total Security 2010 also increased privacy protection through Instant Messaging Encryption to keeps conversations private on Yahoo Messenger and Windows Live Messenger. Moreover, BitDefender Total Security 2010 has improved Optimized Scanning, Parental Control, Intrusion Detection, increased storage protection with File Vault and provides secure on-line storage. On the other hand, it also provides free In-Product Technical Support for the entire duration of the product license and assistance with common issues built directly into the product. BitDefender Total Security 2010 normally cost $69.95 (one PC) (aff) and $79.95 (three PCs) (aff) for purchase through BitDefender Security Store. Users who want to try out BitDefender Total Security can directly download the BitDefender Total Security 2010 free trial setup installer by using links below. 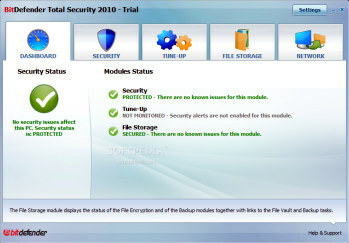 BitDefender Total Security 2010 support Windows XP SP2, Windows Vista, and Windows 7.